This is my favorite green smoothie recipe. I’ve tried several flavors combinations over the years and found this to be pretty awesome. It’s basically banana, spinach or kale, pineapple juice and vanilla protein blended together. The greens slight bitterness almost disappears in the mixture, but still gives a bit of flavor-kick that blends well with the sweetness of the other ingredients. I like to add chia seeds and bee pollen to make it “complete” from a nutritional standpoint. 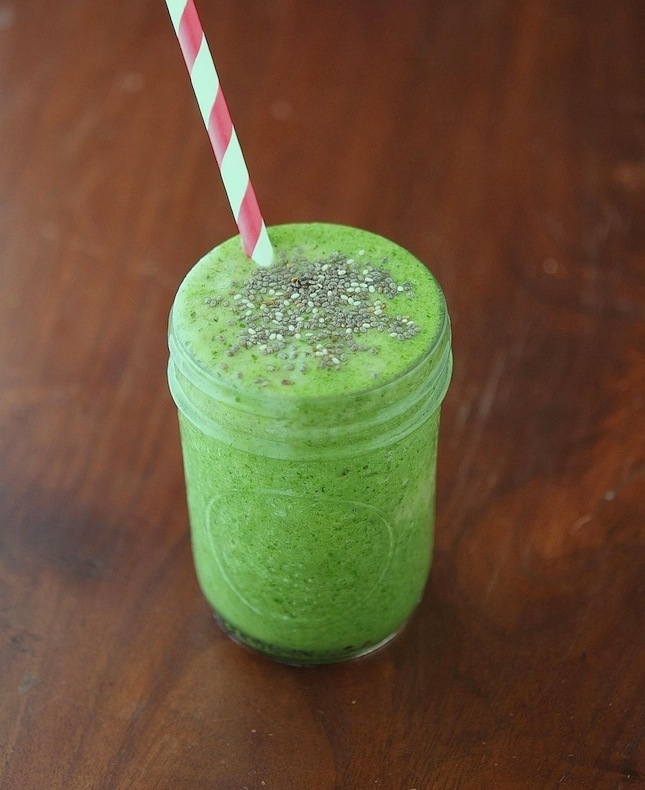 If you have spirulina add some: this smoothie will get even more awesome! Green Protein Smoothie Print this Recipe! Note: feel free to add extra protein powder to get further amino-acids. Combine all the ingredients in a blender, making sure that the spinach sits at the bottom (this will facilitate the blending process). Blend until smooth and creamy. Pour into glass and top with a teaspoon of chia seeds. One serving yields 220 calories, 19 grams of sugar, 18 grams of protein and 4 grams of fat. I love your blog. Well done! I drink green smoothies all the time. Your blend looks good. I like it with spinach too because it can be to grainy with other veg like Kale. what brand of raw vegan protein powder do you prefer? i am doing lots of research, trying to find the best one to buy! thanks! I use this protein powder. It's expensive but the finest! Exercise Can Change (And Improve) Your DNA! Do You Know How Healthy (And Good) Kelp Is?